Lost The Plot – ‘Pune’s first Rooftop Cinema and Bar’, now bring Pune’s first Neon Movie Nights experience to cinephiles, via All Rounder Shots (Phoenix Market City) in Viman Nagar. Neon Movie Nights are a one-of-a-kind, immersive cinematic experience. Housed in a blacked-out room with special neon decor (themed according to each film), this surreal setting is a great way to experience your favourite movies. Their first Neon Movie Nights event was a screening of Ang Lee’s masterpiece – ‘Life of Pi’, where the audience was able to relax in ‘boats’ while watching Pi and Richard Parker do battle with the ocean, surrounded by neon clouds and visuals; and you can expect this kind of themed set-up at all their upcoming screenings. Each film will only be screened once – so if you snooze, you lose! 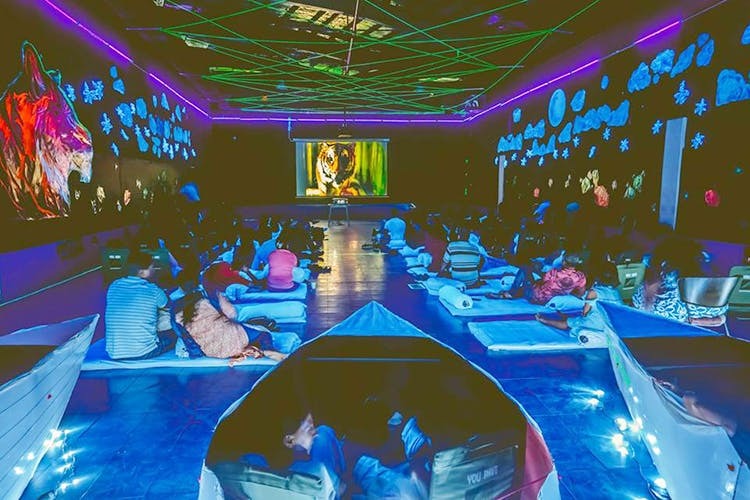 That being said, they are planning to do at least one Neon Movie Night a month, and there will be many more to look forward to.’ Tickets are priced at INR 300 and include a beverage and an appetizer from All Rounder Shots, as well as 2 coupons for their arcade games. We think it’s a steal of a deal, and highly recommend that you book your tickets in advance, as they have limited seating. Find their Neon Movie Nights schedule under the ‘Events’ section on their website, here. Follow them on Facebook for sneak peeks of the visual elements that go into crafting the Neon Movie Nights look and preview videos of their past events. You can sign up for Lost The Plot’s movie membership plans here. Lost The Plot recently completed 4 years, and have moved out of their terrace space at Seasons Hotel in Aundh. They are currently hosting film screenings and events at different venues around Pune – so keep an eye on their social media feeds for all the latest updates.